Professor Inho Jo and his team investigated the therapeutic properties of a small peptide for the treatment of postmenopausal osteoporosis. This molecule, collagen-binding motif (CBM) peptide, showed bone-forming and fat-reducing effects, and thus suggesting a promising potential as an alternative or complementary small peptide drug. This study was published in Biomaterials in 2014. Osteoporosis is a common degenerative disease that causes bones to become abnormally thin, fragile, and more likely to fracture. This is caused by an imbalance between bone resorption (breakdown) and formation. In particular, postmenopausal osteoporosis manifests the decreased bone formation and increased fat production because of estrogen deficiency. Interestingly, fat-producing bone marrow adipocytes and bone-forming osteoblasts have been reported to share a common progenitor cell. Recently, enhanced differentiation of these cells into adipocytes and reduced differentiation into osteoblasts were suggested to be responsible for alterations in bone formation and adipogenesis during aging. Previously, professor Inho Jo’s colleague (professor Yoon Jeong Park at Seoul Nat’l Univ.) developed a CBM peptide (GLRSKSKKFRRPDIQYPDA) that showed osteogenic properties using the rabbit calvarial defects model (published in Biomaterials in 2007). In the present study, professor Jo’s team applied the CBM peptide to human mesenchymal stem cells and reported the increased osteogenic differentiation and decreased adipogenic differentiation. They also observed osteocalcin protein expression in preosteoblastic MC3T3-E1 cells without using common osteogenic inducers. 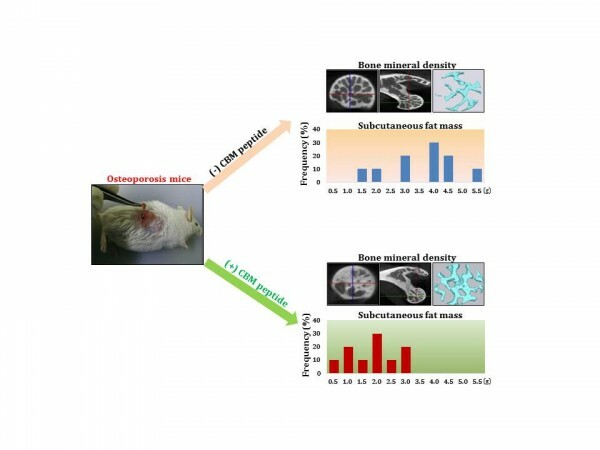 Most interestingly, their in vivo study using ovariectomized osteoporosis animal model showed that the CBM peptide injection significantly increased bone formation and decreased fat accumulation, as evidenced by improved bone mineral density, and decreased fat mass and body weight, respectively. Based on the results, the authors suggested that the CBM peptide may be a promising alternative or complementary therapeutic small peptide drug especially for the treatment of postmenopausal osteoporosis. Selective osteogenesis by a synthetic mineral inducing peptide for the treatment of osteoporosis.